Actors from some of TV’s hottest shows walked our red carpet to shine a spotlight on our girls’ stories at Lights, Camera, WriteGirl! Special guest actors Troian Bellisario (Pretty Little Liars), Wilson Bethel (Hart of Dixie), Alison Becker (Parks and Recreation), Keiko Agena (Gilmore Girls), Aasha Davis (Friday Night Lights), Sprague Grayden (24), Trevor St. John (Bourne Ultimatum) and Mike Rock (Chelsea Lately) joined us to perform original scenes written earlier in the day by our girls. They performed stories of love, longing and so much more. The silent auction featured an array of amazing prizes ranging from autographed books to fine jewelry to spa packages, all generously provided by our wonderful donors. Special thanks also to Castle’s Catering, DFV Wines, Lucky Laughter Photo Booth, Step and Repeat LA and Stone Brewing Company for helping make the night a huge success! A big thank you to the amazing cast who gave unforgettable performances tonight at Lights, Camera, WriteGirl! Thanks Troian Bellisario, Wilson Bethel, Alison Becker, Keiko Agena, Aasha Davis, Sprague Grayden, Mike Rock & Trevor St. John! A benefit evening to support the innovative creative writing, mentoring, and college guidance programs of WriteGirl! Experience original scenes and monologues written by teen girls earlier on the same day and brought to life on stage by celebrated actors. With appearances by Troian Bellisario (Pretty Little Liars), Wilson Bethel (Hart of Dixie), Alison Becker (Parks and Recreation), Keiko Agena (Gilmore Girls), Aasha Davis (Friday Night Lights), Sprague Grayden (24), and Mike Rock (Chelsea Lately), Trevor St. John (Bourne Ultimatum) and more. Fine wine and spirits, exquisite jewelry, fine art, Cynthia Vincent leather handbag, yoga products by GAIAM, portrait photography session, "Wicked" Broadway package and more. VIP Tickets include reserved seating & gift bag. Tickets must be purchased in advance. All proceeds benefit the innovative creative writing, mentoring, and college guidance programs of WriteGirl. Complimentary parking adjacent to theater. Enter off Homewood, one block north of Fountain. Reach an audience passionate about philanthropy and the arts. Several sponsorship opportunities are available. Contact office@writegirl.org for more information. 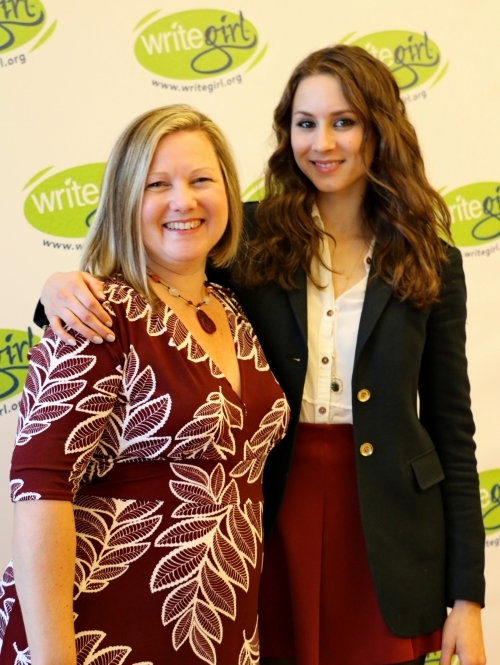 Can't attend the event but would like to support WriteGirl?